Keratoconus is a progressive disease in which the cornea thins and changes shape. It usually affects teens and people in their early twenties. Normal corneas are round, but with Keratoconus, the cornea bulges and becomes pointy or cone shaped. This changes the way light entering the eye, hits the retina and causes distorted vision. Keratoconus can occur in one or both eyes. Keratoconus is difficult to detect, because it comes on slowly. Nearsightedness and astigmatism also accompany this disease, so vision can become distorted and blurred. Glare and light sensitivity may also be noticed. Patients with Keratoconus usually have prescription changes each time they visit their eyecare practitioner. It’s not unusual to have a delayed diagnosis of keratoconus, if the practitioner is not familiar with the early-stage symptoms of the disease. The exact causes of keratoconus are not yet known. It may be inherited, as there are usually several people who suffer from Keratoconus within an extended family. Other causes may include hard rubbing of the eye. In the early stages, eyeglasses or soft contact lenses can correct the vision, but gas permeable (GP) contact lenses may be preferable in an attempt to better control the progression of the disease. The firmer rigid contact lens holds the cornea in place better than a soft contact lens. Fitting contact lenses on a keratoconic cornea is delicate and time-consuming. Frequent follow-up visits are required to fine-tune the fit and prescription. If the cornea continues to thin and distort, the contact lens fit and prescription will need to be changed to continue clear vision and a comfortable lens fit. A new but surgical treatment for keratoconus is corneal inserts. 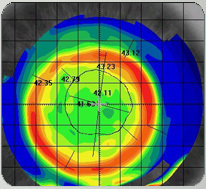 Intacs corneal rings received FDA approval in August 2004 to be marketed to correct or reduce nearsightedness and astigmatism in keratoconus patients who can no longer obtain functional vision with contact lenses or eyeglasses. The procedure involves placing the plastic inserts just under the surface of the eye in the periphery of the cornea. The result is a flatter cornea and clearer vision. Some people with keratoconus reach the point where contact lenses no longer provide acceptable vision. The next step may be a cornea transplant, also called a penetrating keratoplasty. Even after a transplant, patients will most likely still need contact lenses for clear vision.